Try Me! If you want to restore a recycle bin! Recycle bin recovery is easy if you follow the detailed steps in this guide. You likely need to recover your recycle bin because one of two things have happened. 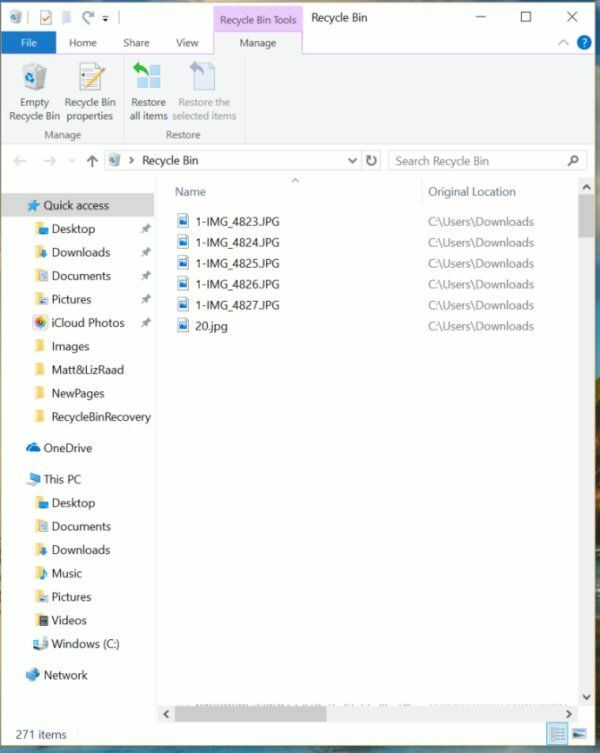 The recycle bin has disappeared and you want to find it so you can recover your files from it, or you simply want a basic guide on how to recover files from your recycle bin. This is a basic operation and will also be covered here in case it helps. If that is not exactly what you are looking for, a link is provided just below to a great article which explains how to recover files from an emptied recycle bin. Read on below. Just because you cannot see the recycle bin doesn’t mean you have deleted it and it is likely you can recover it and the files within it! First we’ll look at recovering a missing or deleted recycle bin, then we’ll show the basic steps to recover files from the recycle bin. It is possible to hide the recycle bin in a number of ways. When you need recycle bin recovery it can be because it is hidden rather than deleted. This makes recovery possible following the steps below. Screen copies are used to help make it simple and easy to follow. To recover a recycle bin first search to find the icon on the desktop just to be sure it is gone before you go to the trouble to recover using these steps. Can’t see the desktop? Well there is a shortcut key combination you can type to see it (one of many ways but my preferred method when a keyboard is available because it is very quick). Press the windows key and at the same time press the letter ‘d’ key. This will minimize all open applications and files. If you need help to find them again look for and click on the appropriate icon on the taskbar. If the recycle bin has truly been deleted or missing you won’t see it there. Be sure to look at all the icons and read the words written below each one. Make sure you search closely for icons that are difficult to see if they are camouflaged by the wallpaper image (the picture that shows when no windows are open). Windows 8 has an extra complication for the basic or new user that may hide the recycle bin making it difficult to find and recover files. The problem is you might be looking at the tile-view not the desktop. Users new to Windows 8 experience this problem at first. Swipe down the screen from the top right hand side using the mouse or your finger to bring up the search and other icons. The search icon looks like a magnifying glass. Type desktop (or in fact you may type Recycle Bin direct as a shortcut). There is a toggle switch to hide or display the recycle bin on the desktop. In the task bar, type ‘Recycle Bin’ and then look down the list of search result options. Look for the heading ‘Settings’ and under it, then look below it for and click on ‘Show or Hide Icons on the Desktop’. If the check box next to Recycle Bin is not checked, then recycle bin recovery will be easy from this point as you have found the problem. You can recover the recycle bin by clicking on the box to put a check mark in it. Then click ‘OK’. This will once again show the Recycle Bin on the desktop. We’ve looked at recycle bin recovery (of the missing or lost icon) so now we show how to recover files from the recycle bin. Select the recycle bin icon on the desktop and press enter, or simply double click the recycle bin. That will display the recycle bin window as shown below (for Windows 10 – other Windows versions will be similar but may look a little different). Just like selecting any files from file explorer you can click the start of a group then hold shift key down and click the end of the group, and you can hold the control key down and click on several individual files. Before you click to restore all or the selected items, make sure you take note of the description of the ‘Original Location’ on the right. On the ‘Manage’ tab, click ‘Restore all items’ or click to select several or just the specific file you want to recover, which will enable the ‘Restore the selected items’ option button. When you click the button, the file or files will disappear from the recycle bin and be recovered to the original file location. You can just close this window when complete. If you look in the original file location that you noted before, you will see your files recovered from the recycle bin and you may also notice that the file date (when or if you are looking at the Detailed View) is the same as the original date. Just to reiterate, this article has been about recycle bin recovery for when you’ve somehow misplaced or deleted the recycle bin and (or alternatively) need to simply restore files from the recycle bin. Don’t forget as stated above that if what you need to do is recover files from an emptied recycle bin, we can help you with that more complicated task. Click the following link for the related article ‘How to Restore Deleted Files After Emptying the Recycle Bin‘. When you’ve lost or deleted files they can normally be recovered one way or another. I always remind people at this point to make sure you have a backup system in place. That way even if you’ve permanently deleted files there is still one ultimate way to recover them. We’ve seen that the recycle bin can be recovered relatively easy (or should I repeat ‘Ridiculously Easy!’) if you have deleted or lost the recycle bin icon. By following the above steps in this guide you can recover your recycle bin by first finding the application elsewhere or resetting the icon to display on the desktop. Also how to recover files from the recycle bin has been set out in the second procedure above. Hope this helps you! Why not take five minutes to share or let me know in the comments below what you think – were you able to recover your files (and even if not, did something else work better for you)?